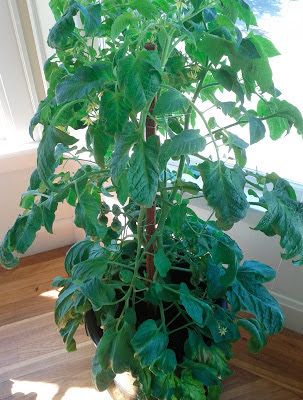 The past few summers I've attempted the near-impossible in San Francisco: Growing tomatoes. Every day it's some combination of cold, foggy, and windy. But I've managed. What's surprising about growing tomatoes is how something so small can grow so big. I start with a tiny sapling in a thin plastic pot. I move it to a larger pot and then water it every couple of days. By the end of a week its mass has doubled. At a month it's over a foot high and blossoming. After two months the first tomatoes are growing fast and the plant is chest-high. Each day I water the plant it looks the same as the day before. I can't notice daily changes because the differences are subtle. I went away for a week and when I got back the plant looked enormous compared to before. When I hadn't seen the incremental changes, the plant's growth was astonishing. Growing tomatoes has made me see the value solely in time passing. How would I be if I spent a tiny bit of time cultivating myself every day? It wouldn't seem like much to me, since I'd witness the small differences. It'd be hard to stick with it. But after two months or a year, I may look back and realize how far I've come. I think this is how I developed as a programmer. I wonder how else I could improve this way.